To our entire longears family, thank all for the support you have given me. A few of you will have read on the Yahoogroups that my husband Chris passed away. I was on the way in to work on Tuesday the 29th, when I got the call from Chris' office. A co-worker found him fallen from his chair, not breathing. He was pronounced at Baylor a short time later. He was 44 years old. Our 15th wedding anniversary would have been this coming February. Many of you had never met him, but those who had may remember that even though he was not "into" donkeys and mules as I was, he was knowledgeable and friendly to everyone he met, and would discuss longears with anyone. He was even learning genetics to be able to understand and help on my lectures. Chris "loaned" ADMS his own email 15 years ago, so that ADMS could take it's first steps into the world of cyberspace. That old address still gets the occasional email asking for information. He was our "Tech support", researching computers. When I began to work for ADMS, we had one typewriter, and a DOS platform computer. He helped up choose new computers, set them up many times, did troubleshooting, installed software. Many times I brought home an old computer that was failing, he copied data, salvaged hard drives, taught me to use programs and to escalate a support call. His background in Tech Support and data programming were what prompted us to continue forward with scanners, higher-tech programs, electronic submissions for membership and applications, and expanding and upgrading the machines that keep ADMS going. He was not a rider, but he rode donkeys and mules with our daughter and I. He brought his camera to shows, shot photos for the magazine, even wrote articles on Y2-K to help everyone get ready for the transition. He came to the office on his days off, helping us to install new software, run virus scans, fix hardware issues. Whether you knew him or not, if you picked up your BRAYER, sent an email, used a credit card with ADMS, or sent in a registration, Chris worked on it in some small way. I am back to work for short periods of time, trying to get the office caught back up. I am sorry to have to let things go last week, but with the holiday and his death, it has been impossible for me to put in the extra hours I had hoped to be able to work on everyone's paperwork. Please do not panic over paperwork, deadlines (other than the BRAYER, which is Feb 1st) or Permanent ID. There is a grace period for the ID - I will set a minimum grace period of six months right now. There is an updated notice about ID in the Jan/Feb BRAYER (mailed yesterday to all that were paid on their dues) and I will add it to the website as soon as I can. Needless to say I have a lot of personal paperwork I must deal with as well as office things. In lieu of flowers, please make a donation in Chris's name (Christopher Michael Patton) - to the gelding incentive fund with NMDA, to St Jude's Children's Hospital, to the Scottish Rite Hospital, or to the charity or cause of your choice. For those that have asked, we are setting up a college fund for Myryha. She will be 14 in just six weeks, and still intends to go through with her plans for college to become a veterinarian. I hope she will be able to specialize in large animals. I appreciate all of the comments, cards and support I have received. 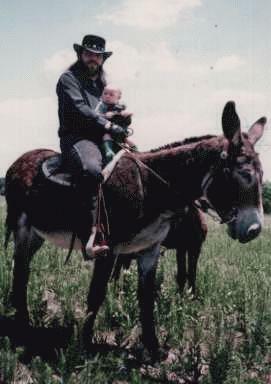 Chris and baby Myryha in 1996, on El Burrito Cupid's Beau. Chris and Myryha with donkey colt.